It is my great pleasure to join you all today for the 2018 Sino-CEE Fund Investment Forum. I would like to first express my appreciation to the organiser for hosting this event in Hong Kong, and extend to you my warmest welcome, particularly those visiting from abroad. When Dr Jiang came to meet with me to talk about this forum, I am sure he was a bit surprised that an official from Hong Kong has been to so many CEE countries. Not many people remember now I had been working in London for 18 months, and during those 18 months, my portfolio covered the entire Central and Eastern European region, so I had been to many of these Central and Eastern European countries. And by the way, during my tenure in London, the Honourable Gordon Brown was the Chancellor of the Exchequer. So I am pretty personally attached to the CEE region. As I told Dr Jiang, I said there was huge potential in these countries that is waiting to be tapped. Hong Kong thrives on trade and finance in an inter-connected world. We have long established ourselves as an ideal hub to pool talents and wealth from around the world in serving a wide spectrum of purposes, be it an exchange of ideas like ours at this very moment, or in search of business and investment opportunities, just as how the Sino-CEE Fund manager (i.e. 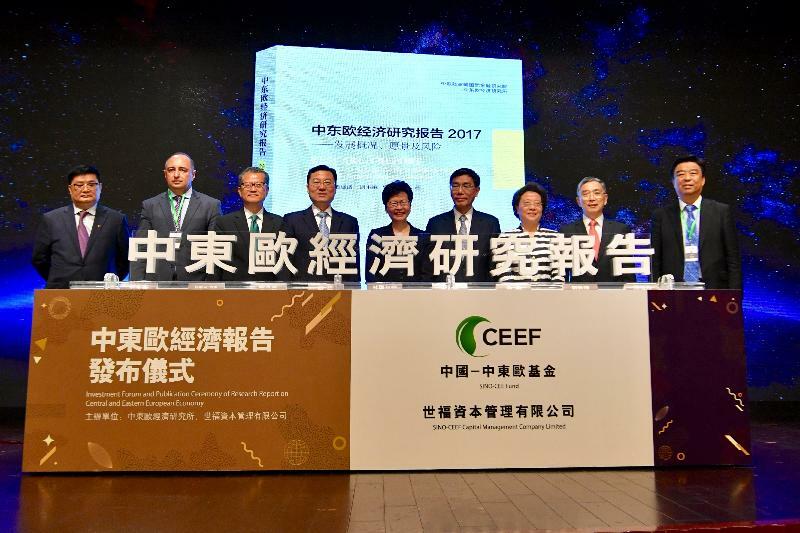 SINO-CEEF Capital Management Company) is doing here right in Hong Kong. Leveraging on our strategic location, as well as our unparalleled expertise in professional and financial services, we are uniquely positioned and well endowed to help promote multilateral economic co-operation and contribute to our national development strategies. Unveiled by President Xi Jinping as "the project of the century" in 2013, the Belt and Road Initiative is a visionary master plan to propel and sustain global economic growth. Since its inception five years ago, it has evolved from a vision into reality with tangible outcomes. China has signed co-operation agreements with over 70 countries and international organisations to foster collaboration in taking forward the Initiative. And Hong Kong is proud to participate in this nationwide development blueprint by entering into an arrangement with the National Development and Reform Commission last December on advancing our full participation in the Initiative. In fact, a team of HKSAR Government officials led by my colleague, the Secretary for Justice, is now on the way to Beijing to attend the first meeting of the liaison mechanism under this Arrangement. The Arrangement attests to the strengths and niches of Hong Kong. As an international financial centre and a global hub for trade and commerce, Hong Kong possesses in abundance the expertise and experience in trade facilitation, infrastructural financing as well as providing professional services in the wealth creation process under the Initiative. The growth momentum of the Mainland, coupled with the opportunities in the Belt and Road countries, bestows on Hong Kong the honour and also the duty to play a pivotal role in the further development of the Initiative. We will strive to maximise our potential under "One Country, Two Systems" and seize every opportunity for economic growth, with the ultimate goal of achieving mutually complimentary and co-ordinated development between the Mainland and Hong Kong. Under the Arrangement, there are six key areas where Hong Kong excels and can make important contribution in the national context, and they are finance and investment; infrastructure and maritime services; economic and trade facilitation; people-to-people bonds; taking forward the Guangdong-Hong Kong-Macao Bay Area development; and enhancing collaboration in project interfacing and dispute resolution services. While I’m more than excited to walk you through the conducive measures one by one, in the interest of time, just allow me to highlight a few on finance and investment to offer you a glimpse of the Arrangement implementation so far. Infrastructure development and investment is the cornerstone in enhancing connectivity under the Belt and Road Initiative. According to the estimates of the Asian Development Bank, infrastructure investment of as much as US$1.7 trillion per year will be needed until 2030 in Asia alone. The magnitude will be even higher for the entire Belt and Road region. To address these huge financing needs, multiple frameworks of public financing mechanisms have been put in place, including the Asian Infrastructure Investment Bank, AIIB, and the Silk Road Fund. Apart from public investment, it is also critical to draw in private sector investment and financing to bridge the substantial funding gap. To foster public-private partnership and collaboration, the Hong Kong Monetary Authority has set up the Infrastructure Financing Facilitation Office with a view to facilitating infrastructure investments and their financing through working with a cluster of key stakeholders. Since its establishment in July 2016, over 80 organisations from the Mainland, Hong Kong and overseas, including multilateral financial agencies and development banks, asset managers, commercial banks, insurance companies, project developers and operators, as well as professional service firms and international business council, have joined the platform as partners. Last September, the Hong Kong Monetary Authority signed an agreement with the International Finance Corporation (IFC), committing US$1 billion to the innovative Managed Co-Lending Portfolio Program which is a debt mobilisation platform for emerging markets. Our support to the IFC in financing projects across more than 100 countries, ranging from infrastructure, telecom to agri-business and services, could serve as a catalyst for attracting private sector capital into infrastructure investment and financing. As much pride as we take in being a leading international asset management, risk management and corporate treasury centre, we are determined to up the game in developing a more conducive environment with a variety and diversity of financing channels for businesses to set foot in Hong Kong. Apart from a clear statement laying down the pathway for infrastructure project companies to achieve listing in Hong Kong, we are also making an effort in spurring the development of our bond market. For instance, our recent launch of the Pilot Bond Grant Scheme offers grants to first-time issuers in Hong Kong to cover part of their issuance expenses. Reciprocally for investors, tax concessions for qualifying debt instruments will also be enhanced to encourage their participation in the bond market. In tandem, half-rate profits tax concessions for corporate treasury centres, as well as professional reinsurers and captive insurers will be further extended. I would also like to take this opportunity to announce an upcoming launch of the Belt and Road Insurance Facilitation Platform to facilitate insurance and reinsurance placements and services for projects or investments along the Belt and Road route. Looking ahead, we will continue to keep ourselves busy in greasing the wheels for this long journey to deliver on our full commitment in the Arrangement. With strengthening economic and trade connectivity between the Mainland and the Belt and Road economies, RMB will be increasingly used in bilateral trade and investment in the region. Hong Kong's status as the largest offshore RMB centre, with 70 per cent of offshore RMB settlement taking place in Hong Kong as well as having the largest RQFII quota in the world, will be of paramount importance in this process of Renminbi internationalisation. We will continue to closely engage the industry and relevant Mainland authorities to explore expansion of the channels for two-way flow of cross-border RMB funds and promote further mutual market access arrangements between the two places. Following the G20’s call for scaling up green finance under China's presidency in 2016, a green, healthy, intelligent and peaceful Silk Road has since been reinvented to bring the concept of green finance and sustainable infrastructure into the mainstream. We envisage an increasing role for our capital markets to finance green projects, serving the needs of both the Mainland and economies along the Belt and Road. Action speaks louder than words. Having received favourable market response on our first local Green Finance Certification Scheme since its inception earlier in January, we will soon be establishing a Green Bond Grant Scheme to subsidise the costs issuers incurred in obtaining certification under our local Scheme. In addition, a Government Green Bond Programme with a borrowing ceiling of HK$100 billion will soon be launched to jump-start market development. We are encouraged to become the preferred location for the issuance of green bonds by a multitude of local, Mainland and overseas enterprises, as well as international organisations such as the Asian Development Bank, the World Bank and the European Investment Bank. The ancient Silk Road was the epitome of human wisdom, perseverance and solidarity. Following the footsteps of our great ancestors along the ancient Silk Road, we're about to make our mark in pursuing the modern-day Belt and Road Initiative. As the saying goes, the journey of a thousand miles begins with a single step. This echoes well with today’s theme of “investing for mutual benefits, collaborating for progress”. 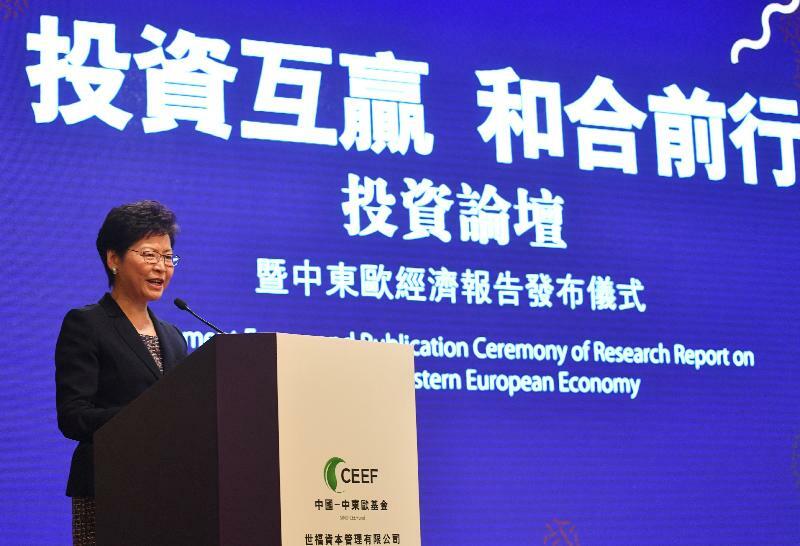 I look forward to the informative economic research findings on Sino-CEE relations and the enlightening roundtable discussion coming up next. May this bring about our more frequent and closer collaboration in one way or another in the coming future. Last but not least, before leaving the floor to Dr Jiang on our much anticipated keynote speech by him on Sino-CEE financial and investment strategies in the context of the Initiative, allow me to do a little promo on our upcoming annual Belt and Road Summit to be held on June 28 under the theme of "Collaborate for Success". We hope to see some of you at this international event in Hong Kong.